If it weren't for the telltale palmetto trees and notable landmark neighbors, like the historic Dock Street Theater, a visitor might mistake this church for an authentic French house of worship, tucked away in a European countryside of decades ago. This unusually fascinating façade is just the tip of the iceberg for this building, however, as the French Quarter structure holds a number of minor but nonetheless notable claims to fame. As the only French Calvinist congregation in the United States, the active congregation quietly makes history in the chapel, while the church itself, a mid-1800s masterpiece, serves as one of the first examples of Gothic Revival architecture in Charleston - a notable feat for a region that is known for its historical buildings. While the church is open for weekly services and sporadically open to the public, everyday visitors may not always be able to tour the inside, but the exterior itself is well worth the trip. A pristine collection of brilliant white stucco and ornate towers, the unique French Huguenot Church is a prime example of Charleston's deep seated love of all things beautiful, historical, and altogether culturally surprising. The current French Huguenot Church, the third structure to be located on its current Church Street site, was constructed in 1845 by the versatile local architect, Edward Brickell White. In an era when brilliant architects were seemingly common in Charleston, White broke the mold with his design and construction of the almost-massive brick Gothic structure. Generously decorated with windows, buttresses, and impeccably designed decorative touches that were the hallmark of the popular Gothic style, the heavy application of these features was unusual in southern Charleston, but nevertheless appreciated by community passer-bys and congregants alike. Before the current 1840s church was built, the French Huguenot Church had a surprisingly long history that dated back to the origins of the original English Charles Town settlement. In 1687, the first church of this denomination was constructed, but was intentionally demolished in 1796 in an effort to control a great fire that was sweeping through the region. A second church was built in 1800, with regular services reinstated and timed with the incoming and outgoing tides to accommodate the majority of parishioners who arrived to the church by boat from the outlying plantations. Despite its early roots that coincided, more or less, with Charleston's original settlement, the local French Huguenot population declined over the decades, and the church closed in 1823 due to a lack of regular congregants. In 1844, however, Huguenot descendants revived the remaining small cluster of parishioners, and a new building was planned to help rejuvenate the congregation. The second church was torn down in 1844 to make way for this new place of worship, and the end result is the current masterpiece that stands today - a chapel that has earned a place on the list of National Historic Landmarks. For the majority of the 1900s, the church was home to a limited number of church services, sponsored by the Huguenot Society of South Carolina, in addition to a handful of private special events and wedding celebrations. In 1983, however, the active congregation was reestablished, and today the church is the only Huguenot Church in the United States, and holds regular services in both English and French. Today, the church defines itself as the French Protestant (Huguenot) Church, and remains very active in the local community. Hosting a number of open houses and public gatherings, like Oyster Roasts or historical tours, the church has garnered a new base of both regular parishioners and occasional visiting fans of all denominations. The church even has its own Facebook page at https://www.facebook.com/TheFrenchChurch, where it announces local news, shares tidbits of its rich history, and posts upcoming services and events that are open to everyone and anyone passing through. In addition, the church holds seasonal hours of operation, generally Monday through Friday from 9:30 a.m. until 1:30 p.m., where a trained visiting docent happily leads Charleston visitors on a tour of the church and its historic facilities. 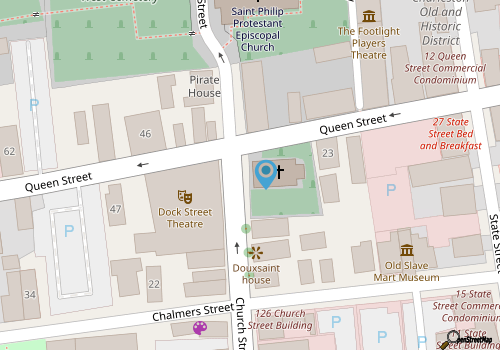 Hours are always subject to change, and in most cases, visitors who are strolling through the French Quarter luckily come across this landmark while it is open to the public, and embark on an impromptu, guided exploration of the church. History buffs and architectural fans who want to make sure they visit the site while it's open are advised to call ahead to ensure tour availability at 843-722-4385. The gorgeous church is also available for weddings, and many couples find the venue a respectful but beautiful locale for romantic religious ceremonies. Again, event planners and couples-to-be should call well in advance for availability and booking procedures. Clearly, the French Huguenot Church stands out in historic Charleston in more ways than one, from its decadently beautiful Stucco exterior to its small but loyal group of regular parishioners. A remarkable cultural and historical landmark, the church lends some distinctive charm to Church Street, and makes a complete tour of the French Quarter and historical Charleston itself a surprising, and multi-faceted event. Open to the public and parishioners alike, the French Huguenot Church continues to make history while honoring its unique architectural past, and visitors will find this legacy and continuing mission is perfectly in synch with the modern yet legendary Charleston, South Carolina. New Charleston visitors are often advised to start their regional tour with a visit to the historic City Market, a massive four block meeting place that sells homegrown goods and exquisitely crafted arts and crafts from all over the low country. A Mecca for commerce for well over 200 years, and anchored by the historic Market Hall which gives the ensuing indoor / outdoor shops a worldly entrance, City Market is sure to wow visitors with endless stations of vendors, and keep avid shoppers busy for hours, if not for days.